The new spy thriller series stars Max Irons as a low-level CIA analyst who hopes to reform the agency from within. But instead, he finds himself linked to a plan that threatens to take the lives of millions after he survives a mass killing of his colleagues. The first two episodes of the series air back-to-back tonight. Our new favourite comedy continues as we watch Marnie being tormented by intrusive sexual thoughts in the form of an obsessive compulsive disorder. Tonight, she is determined to make the most of her single life in London and sleeps with someone she possibly shouldn’t. 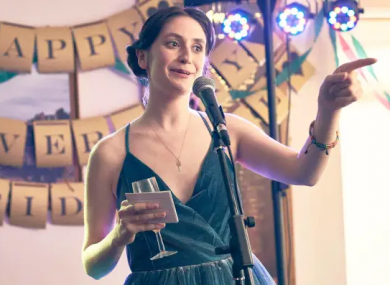 It might not be the Irish (and better IMHO) version of the show, but tonight on E4 the original series sees another batch of singletons trying to find that spark with a complete stranger. Tonight we meet self-proclaimed geek James who is matched with Holly. Literally shaking with nerves as they meet, Holly is looking for someone to boost her confidence. Right lads, it’s no joke – the trailer for series two of Derry Girls has just landed and we don’t know how much longer we can wait for new episodes. The girls (and James) are back in action this time meeting some Protestant boys on a school trip away, heading to a Take That concert and a big school dance. And if that isn’t enough to get you excited, hearing the first chord of The Cranberries’ Dreams will surely do it. No word yet on when exactly we can expect the show to return to our screens but a trailer means we’ve not long to go now. Operation Transformation (RTÉ One, 9.35pm) Our five leaders are back to face the scales after webcams were placed in their fridges last week. Crimson Tide (ITV4, 9pm) Military thriller starring Gene Hackman, Denzel Washington and Viggo Mortensen. MasterChef (BBC One, 8pm) The new series continues with seven new amateurs trying to prove themselves in front of the judges. Olympus Has Fallen (Channel 5, 10pm) Not the Channing Tatum/Jamie Fox one, but the Gerard Butler/Morgan Freeman one. The Nutty Professor (Comedy Central, 8pm) Eddie Murphy stars as the terminally shy professor who transforms himself into what he thinks women want.